The musical career of Dennis Brown started when he had just graduated from high school in Aberdeen, S.D. and was a member of a local band, the Vicounts. From there he enrolled at Brown Institute of Broadcasting in Minneapolis. 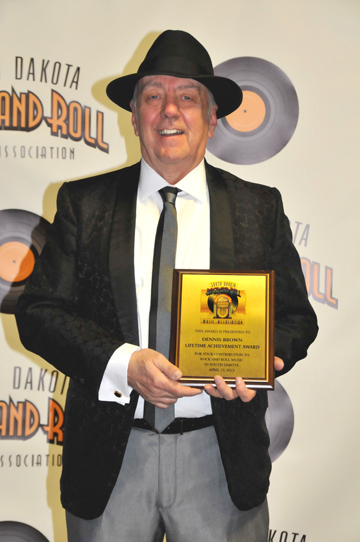 After graduating Dennis returned to his hometown and worked for a short while at KSDN Radio. His career continued as he gained experience working at stations in Pueblo, CO, Jamestown, ND, Rapid City, Omaha, and Minneapolis. In 1974 his perseverance paid off and he was hired as the "afternoon drive" DJ at KPAM in Portland, OR. It was there that Dennis produced a soundtrack for the Portland Trailblazers, co-writing the lyrics and music. While in Oregon, Dennis played his music and also recorded an album in 1981. An opportunity arose for Jim in Los Angeles where he worked at station KZLA for the next eight years followed by a return to Oregon where to turned KXPC into the #1 country station. Today Dennis lives in Grants Pass, OR, has a recording studio in his home and is still making music.